Want to enable more social sharing on your site? Get Shareaholic’s Share Buttons now. So Pinterest is a pretty big deal–if you’re a follower of Shareaholic, this isn’t news to you. With the addictive nature of the platform and it’s wild growth over the past 18 months, it’s not surprising contests and giveaways have become popular. And how convenient: the words ‘pin’ & ‘win’ rhyme. Seems only natural to see promotions spring up on Pinterest. But what does ‘Pin It To Win It’ actually mean? How does a ‘Pin It To Win It’ contest work? What’s the Definition of ‘Pin It To Win It’? That question can only be answered by you. Seriously, it’s the wild west right now in Pinterest promotion-land and you’ve probably seen a lot of creative and awesome promotions spring up because if it. Folks use the term ‘Pin It To Win It’ because a) it signifies a Pinterest promotion is running, b) it’s the term everyone knows and is familiar with and that’s partly because of c) it rolls off the tongue so well. There have also been variations of promotions where entrants pin items they want to win. So why a promotion on Pinterest? Depends on what you’re trying to accomplish. Could be a fun way to give back to your readers, increase site traffic, grow your Pinterest following, bring awareness to a new product, or help rid of excess inventory. The sky’s the limit. And that’s why these ‘Pin It To Win It’ contests have become so popular. Compared to Facebook’s promotion guidelines, Pinterest’s rules are pretty relaxed and open to interpretation. In fact, Pinterest just recently announced Pinterest for Business earlier this month, which included a few paragraphs about Pinterest promotion guidelines (details here). I know I said there are no such thing as rules set guidelines to a PITWI promotion–but hang tight! While that’s true, there’s a popular Pinterest contest template that many brands have used to run their ‘Pin It To Win It’ contests. Let’s draw up an example. The above example is pretty common. But it’s tried and true. Slap together some terms and conditions along with a free year’s supply of sweets and we’re off to the races. If you’re looking for a ideas for your first Pinterest promotion, this is a great place to start. Get creative–the sky’s the limit. Why not ask folks to upload their own images to their board? Maybe turn it into a contest where folks compete over who can make the best gingerbread house. Set up different categories and prizes. Go wild! Or go in a different direction altogether. Design a scavenger hunt. Partner with other bloggers. The possibilities are endless. While you still should keep focused on your promotion’s end goal, sometimes experimenting and trying something completely new pays off. Don’t be afraid to take a risk! There are so many things to consider when you run a ‘Pin It To Win It’ contest. You’ll discover many of them as you go, but consider the nine below as a starting point. Create a Title Image. An attractive image that looks good on your blog, looks good on your followers’ Pinterest boards, that describes the promotion’s terms will not only add to the legitimacy of your promotion, it’ll also help spread the word. Hashtags & Captions. Asking entrants to add a hashtag to their pinned image can help you track the promotion as well as allow them to follow along. Having folks leave a caption alongside a hashtag that answers a question can create more of an emotional connection. Board Category. 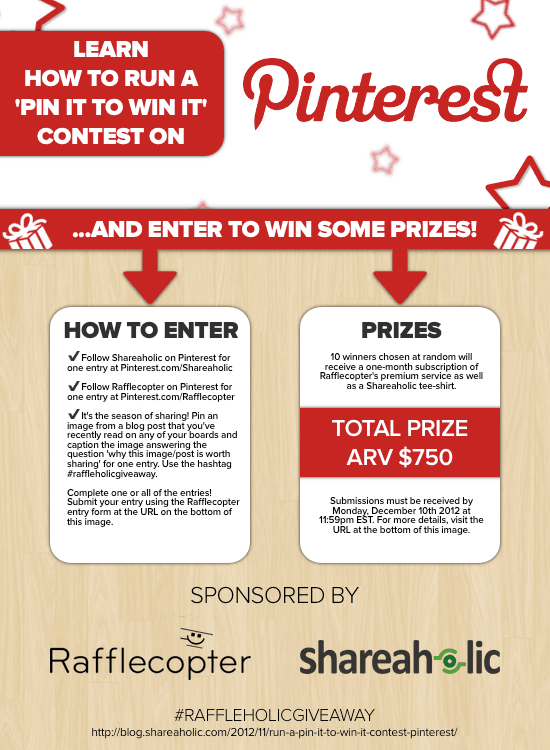 If you ask folks to create a board in your Pinterest promotions, they’ll have to place their board in a category. Terms and Conditions. Both you and your readers deserve to be protected. When the giveaway starts, who is eligible, how to officially enter, and the prizes are all items that should be included in your promotion’s terms and conditions. Tracking Entries. You’ll need a way to track entries into your promotion. Rafflecopter can help facilitate this process. We’ve also seen many folks ask their entrants to email their entries. Clear Instructions. In addition to your terms and conditions, the instructions that you present to your readers should be clear. Chances are you’ll have a few steps for your entrants to follow. Help them every step of the way. Entrant Effort vs Prize Value. Don’t give out $10 gift cards to two lucky entrants that create a board with over 50 items. No one wants to work to the point where the payout isn’t worth it. Contest vs Sweepstakes. Consider if you want your promotion to be a contest or a sweepstakes. A contest would require judging and a little more brainstorming around how the winner will be selected. A sweepstakes would require choosing a winner at random, which is logistically easier. Giveaway Best Practices. Probably not a bad time for an online giveaway best practices refresher – check out the ‘4 P’s to a Successful Online Giveaway’. Rafflecopter & Shareaholic Giveaway: Enter To Win! Boosh! Before you head off to create your own promotion, we’ve got something for you to check out. We’ve teamed up with Shareaholic to run a giveaway of our own. 10 winners will receive a one-month subscription to Rafflecopter’s premium account (to be released tomorrow!) and a Shareaholic tee-shirt (ARV $75 ea., $750 total). 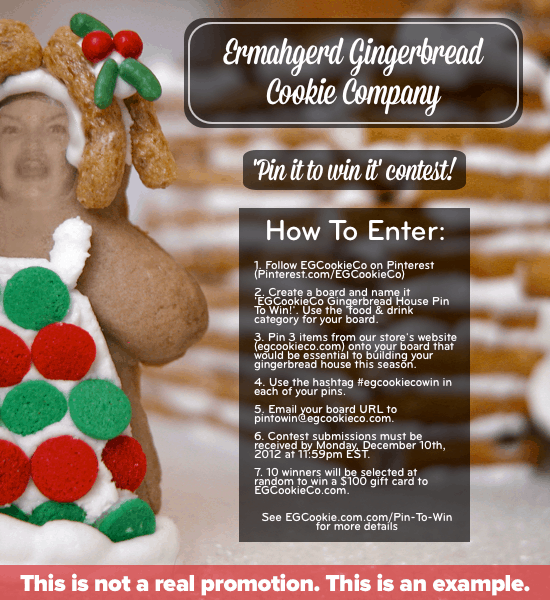 Check out the image and enter on the widget below! All images pinned in this giveaway will be compiled on a board in Rafflecopter’s Pinterest account. Giveaway is open worldwide and ends at midnight EST on Monday, December 10th. 10 winners will be notified by email. Enter To Win Below – Good Luck! Greg Goodson is the cofounder of Rafflecopter.com, an app that makes it crazy simple to run and manage giveaways on your site. Since Rafflecopter’s public launch in December 2011, he’s watched over 400k giveaways launch through their platform.